This is post 100. To celebrate let’s torch up some sushi. My born in Vancouver but currently based in Toronto sister, The Planner, was in town and she had a hankering for Vancouver sushi. The funny thing about cravings is if you don’t satisfy it with a good enough offering, the craving ends up being more intense instead of going away. So with that in mind, I thought let’s go to Miku to get a view of the ocean, which The Planner missed dearly as well. The pickles might seem like an odd choice. 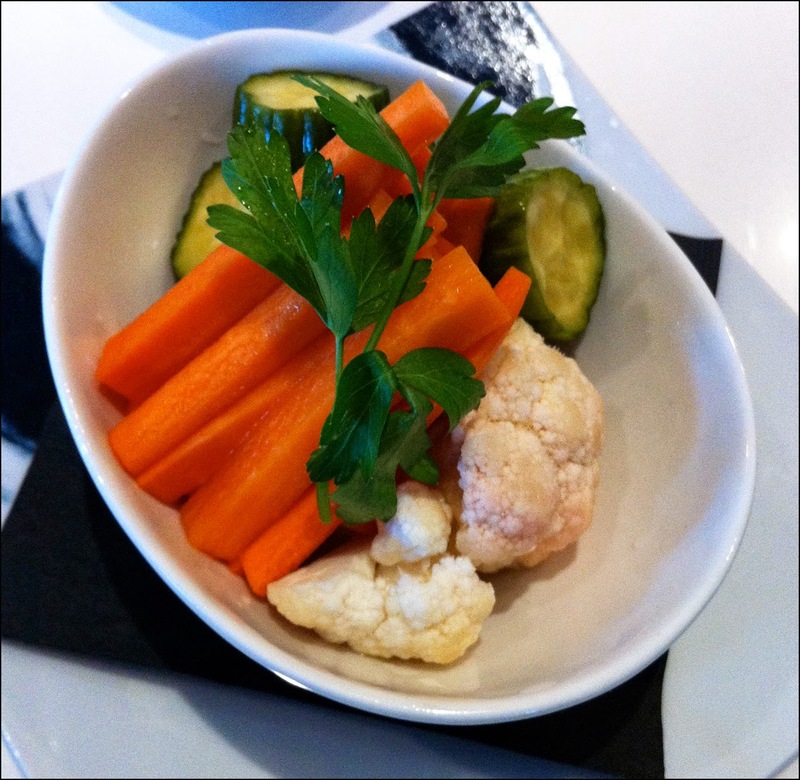 However, I had a craving for them and wanted their ability to cleanse the palate and stimulate our appetites. There were crunchy and not too sour. With a front seat perch, the sushi chefs seemed to have their hands full as the ticket machine just continually spat out orders after order. Not surprisingly, our baked Sablefish from the kitchen came out ahead of our raw fish orders. The cooked entrée was beautifully plated. 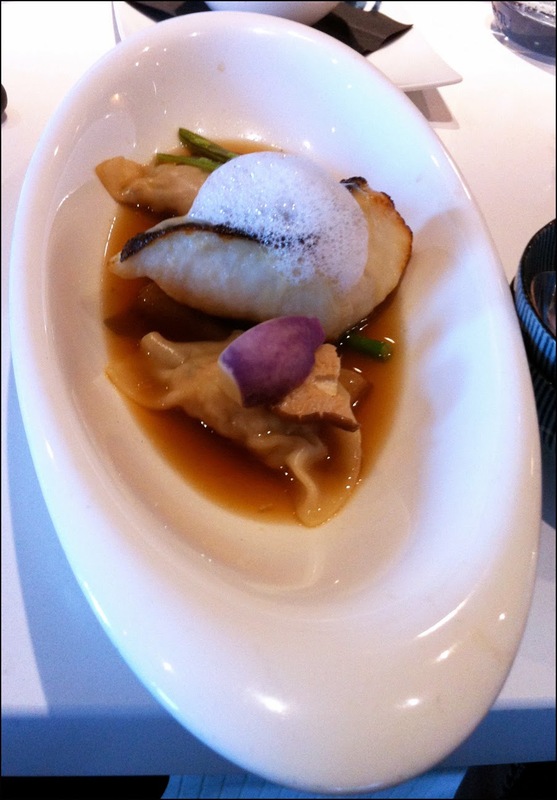 It consisted of two shrimp dumplings, the Sablefish, topped with a Yuzu foam while sitting on top of veggies (snow peas, beans, mushrooms and radish), and a dashi broth. All the accompanying items were executed well. The filling of the shrimp dumpling was nice and sweet. The Sablefish was cooked perfectly. However I thought it was under seasoned and didn’t have the same depth of flavour as similar dishes from other Japanese restaurants in town. The sashimi arrived next and WOW! 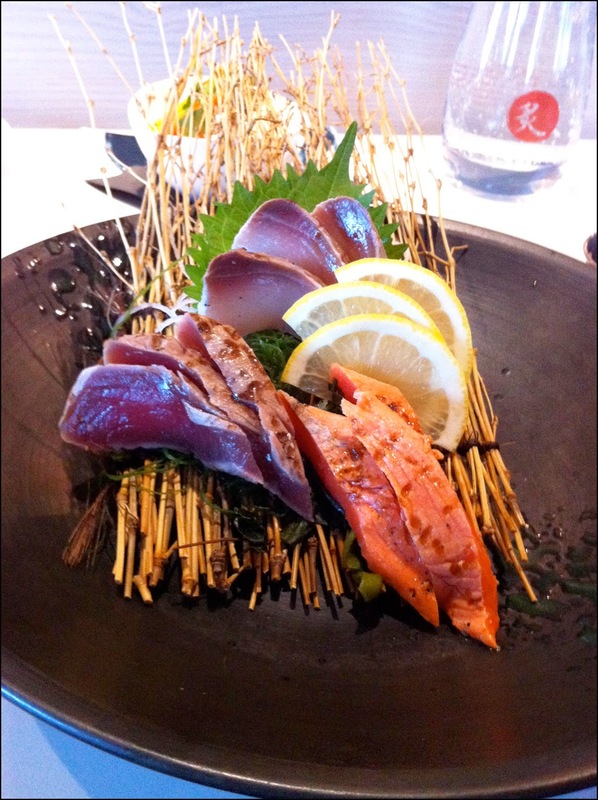 Stylishly presented, the charcoal torched slices of sockeye salmon, maguro and hamachi were fantastic. In particular the sockeye salmon was super sweet and full of umami flavour. Combined with the subtle charring from the aburi technique, this local orangey red piece of sashimi was amazing. On their own, the sashimi was great but each type of fish came with its own sauce. There was the peach coloured mentaiko sauce for the salmon, the chunky wasabi masatake sauce for the Maguro and a mint green avocado puree for the Hamachi. Both The Planner and I liked the creaminess of the mentaiko sauce. 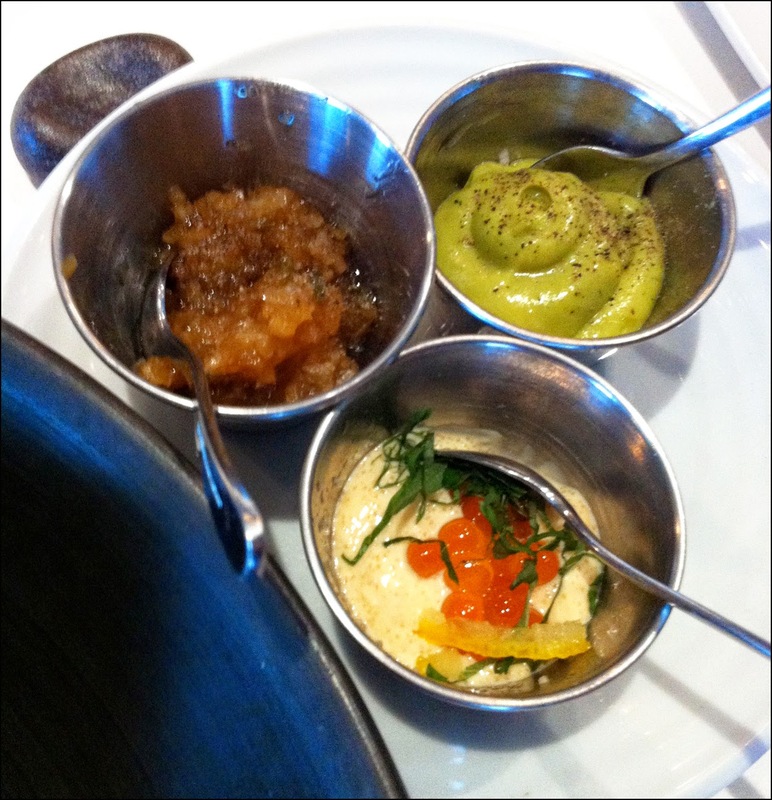 It very much reminded me of the Greek Tarama dip in terms of taste and texture. We ended using the mentaiko sauce for all fish on the platter. Finally, Miku’s most renowned dish arrived. The Salmon Oshi Sushi derives its name from the type of sushi it is: Oshizushi (a.ka. box sushi or pressed sushi). With a clear view of the sushi chefs, I watched as they placed the rice and salmon in the oshibako mold, press down and then pop out the long rectangular piece of sushi. The chef expertly cuts the molded sushi into bite size pieces. Another chef tops the sushi with a creamy sauce and slices of Jalapeño. 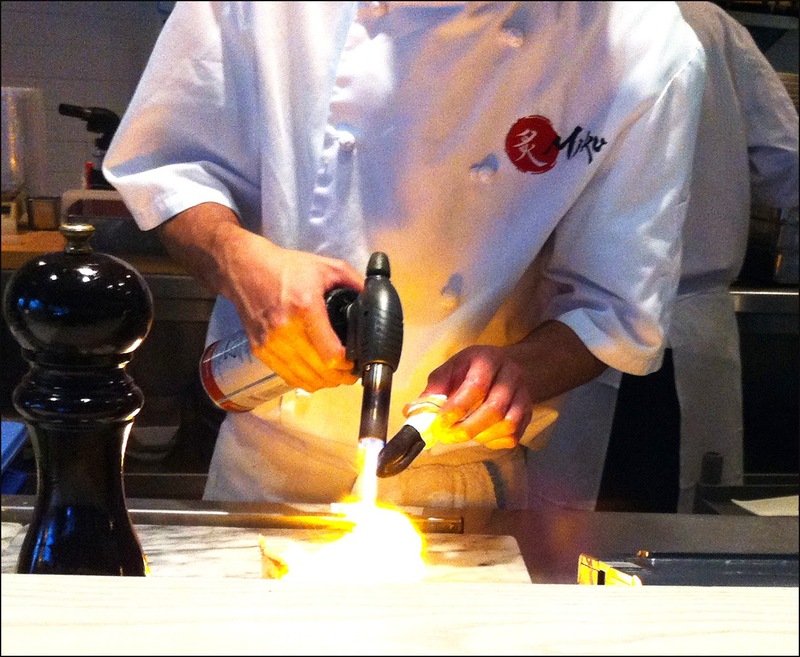 He then deftly employs the aburi method of using a torch and a piece of charcoal to quickly flame the sushi. The result is a delicious piece of aburi salmon sushi that melts in your mouth. The grains of rice, despite being pressed, instantly break apart when you place it in your mouth. The rich fatty taste of the salmon is heightened from the heat. The special sauce adds a layer of creaminess. Even the thin slice of Jalapeno has an important role as its spiciness adds a kick to help balance out the sushi from being to heavy tasting. The Salmon Oshi Sushi is imitated at eateries around town and justifiably so as Miku’s creation is just awesome. To conclude our meal, The Planner and I ordered our own desserts. 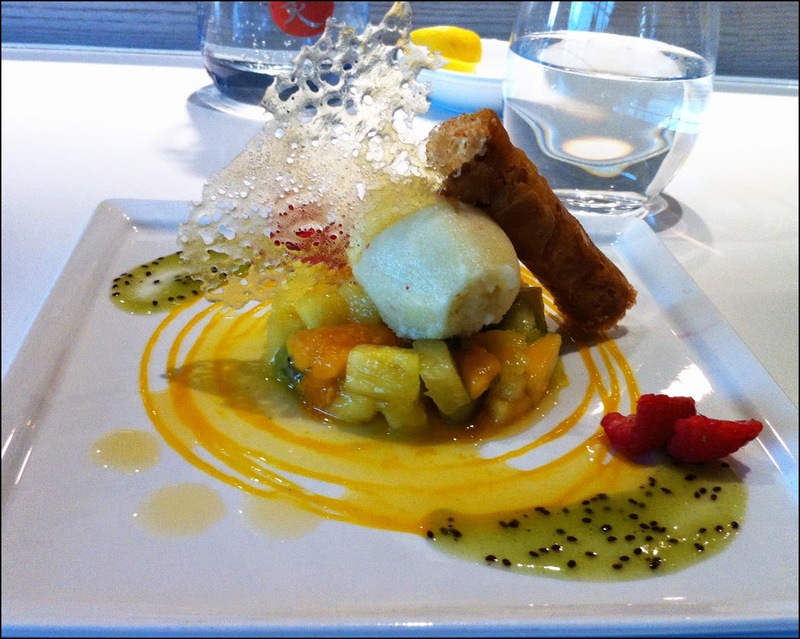 I wanted something light and selected the Tropical Brunoise, which essentially was a fancy fruit salad that came with a crispy passion fruit cannoli. Sweet and refreshing, it hit the spot. The only thing I would change is I wish they served it in a bowl instead of a plate as I had problems scooping up the last few cubes of fruit. 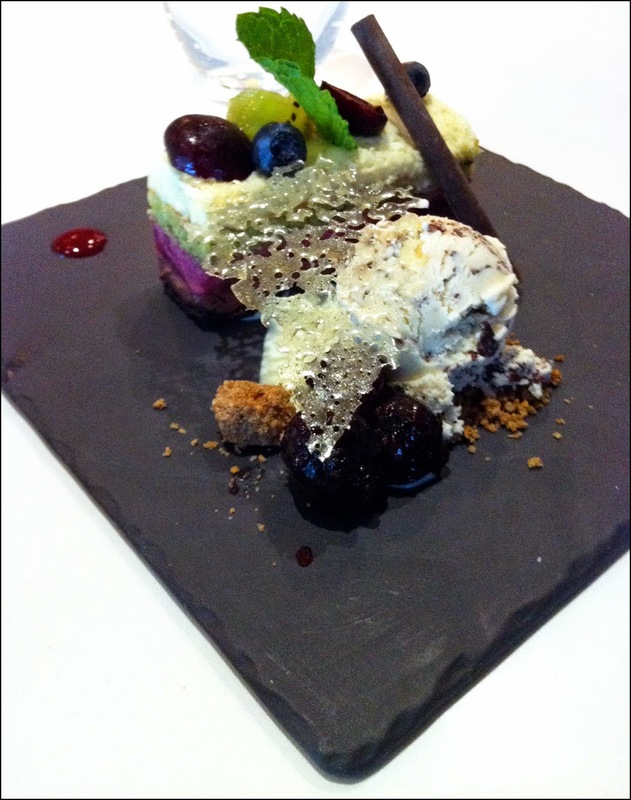 My sister chose the more decadent Cherry Cassis Slice. I assumed she enjoyed it as she ate everything and had a smile on her face. The sushi is executed so well at Miku, it just out shines everything else the restaurant serves. In short, when you visit this tony waterfront restaurant stick to raw stuff, especially the aburi items.